Yeah, I know, everybody brags about large gains in a short amount of time. Drop 10 pounds in 4 weeks, realize 10 percent on your investment in only 90 days and so on. However, this is a post of what happened and not what someone hopes you will believe can happen so that you will purchase a product. I will also give you the product for free because I found it amidst my searching for a free training plan. Backstory: I had a disappointing year on the bike. I did not hit any of my goals during my races on the bike, and this was annoying because biking is usually my strongest discipline. I can attribute it to a few things, or in other words give excuses, but plain and simple I just want to be faster on the bike. So during my down month of October, I scoured the world wide web to find a PDF version of a training plan that I could carry out on my trainer during November and December. Hunter Allen graciously made available such a plan. Here is the link: Hunter Allen Wheelbuilder Training Plan. 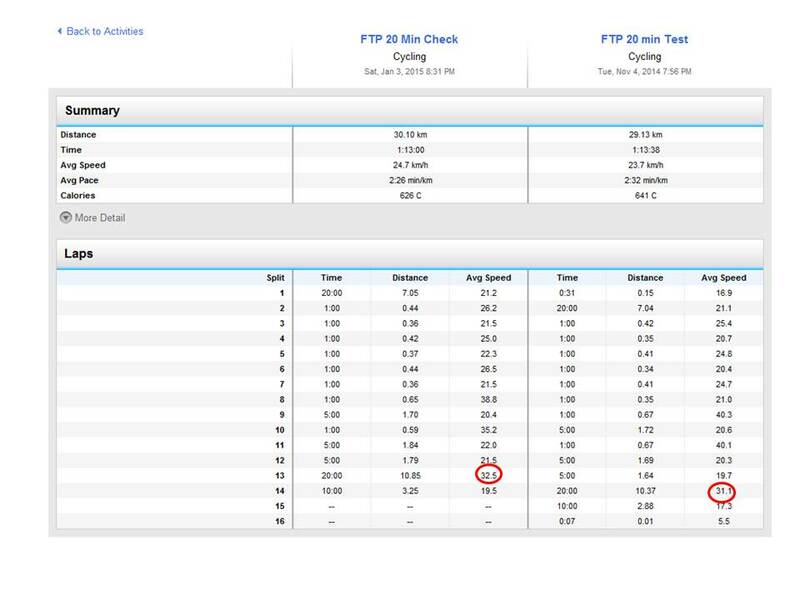 Two FTP 20 Minute Tests before and after 8 week training plan. For November 4th the average power calculated from the average speed for the 20 minute test was 235 watts. The protocol stipulates that your FTP is 95% of that number or 223 watts. On January 3rd the average power was 266 watts which produces an FTP of 252 watts. BOoyah! I know I still have a ways to go to get my FTP to where I want it (>275), but gaining that 13 percent puts me back to where I think I was mid-summer during my best year to date. Not bad for a free training plan.